Flush only toilet paper in the toilet! Your drains are not a trash can. The water from your home or business ends up in one of the most beautiful parts of our community - the San Francisco Bay. Disposing anything other than toilet paper down the drains can cause Sanitary Sewer Overflows (SSOs) and will severely impact your plumbing system, the sewer system, and processes at the treatment plant. Thursday - Saturday, 8am - 3:30pm. Call ahead for details. The Novato Household Hazardous Waste facility accepts a variety of toxic waste from Novato residents free of charge. The Facility is open on the first and third consecutive Sundays and Mondays of each month from 8:30am - 1:30pm. Certain businesses may dispose of hazardous wastes for a fee. PROTECTING WATER QUALITY STARTS WITH EACH OF US! Your drains are not a trash can. The water from your home or business (toilet, shower, kitchen, etc.) ends up into one of the most beautiful parts of our community, the San Francisco Bay. Throwing anything other than toilet paper down the drains can cause sanitary sewer overflows (SSOs) and will severely impact your plumbing system, the city’s sewer system, and the processes at the treatment plant. 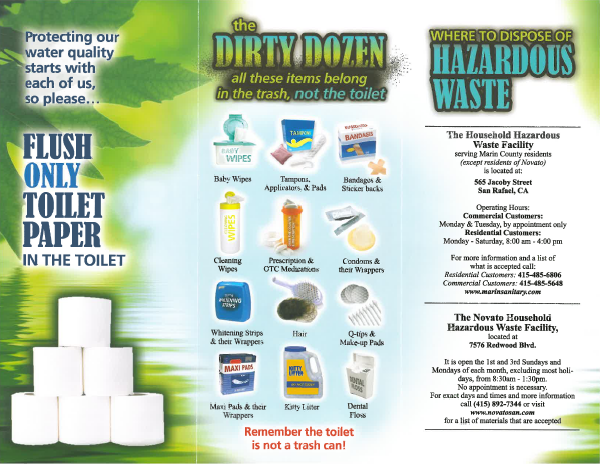 Please take a few minutes to download our "Flush Green" flyer and learn more about properly disposing of waste. Curriculum Materials for students K thru 12 from the Water Environment Federation. What happens after the flush? - A brochure from the EPA. Environmental Kids Club - Environmental fun and games from the folks at the EPA. Wastewater World - A short film by by Chris Wiggins and Trevor Marsh. Voted 2008's BEST EDUCATIONAL/AMATEUR VIDEO by the California Water Environment Association Film Festival. Brought to you by our friends at the Delta Diablo Sanitation District. An interactive diagram of wastwater treatment. The Aquaventurer Time Machine - An interactive voyage through wastewater past, present and future! Lots multimedia. Don't miss this one! Prescription drugs flushed down the toilet and other chemicalsintroduced into the Bay Area’s wastewater collection systems have been detected in the Bay’s estuaries and marine life. Since wastewater treatment plants are generally not equipped to detect or remove the evolving collection of ingredients in this chemical cocktail, it makes more sense to treat the source if possible, rather than to deal with expensive downstream problems. DO NOT pour toxic substances down the drain! They will harm the treatment process or the environment. DO take them to a hazardous waste disposal center. The pipeline leading from a home or business, called a sewer lateral or side sewer, connects to the District's sewer main. The sewer lateral is the responsibility of the property owner. If your home or business fronts on a steep road, there is a risk of sewage backup. Contact the District to determine if you have a proper backflow prevention device installed. Call the District at (415) 435-1501 if you notice sewage overflow in the street. 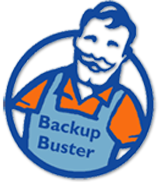 If the backup is on private property, the property owner is generally responsible, and a plumber should be called. Common household substances—such as paint, solvents, pesticides, motor oil, antifreeze, and battery fluids—are toxic pollutants. Keep them out of the sewer system. Call (415) 499-7868 for more information on toxic materials. Notify the District before clearing roots from your sewer lateral, so the District can prevent chopped roots from clogging the sewer mains. Your sewer line should never be broken or cut to connect to a rain gutter. Tree roots or contaminants can enter, creating maintenance, health, and environmental problems.